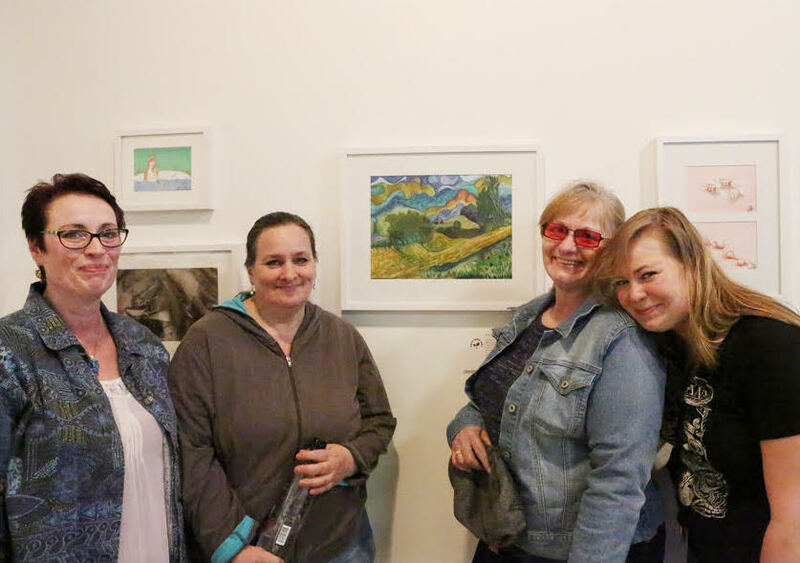 Tracy Lester standing beside her first exhibited painting with her sisters and niece. When Tracy Lester was 20 years old, she met a man through her work. They got along, treated each other well, and eventually decided to move in together – they would wait for the newspaper every morning so they could do the crossword. After their first child was born, though, he became abusive – at first emotionally, and later physically. One day, after their fourth child was born, Tracy left for the grocery store to buy a gallon of milk and never went back. She and her children moved into the shelter system, and eventually to a new home. In the fall of 2016, Tracy’s caseworker at Sound Mental Health told her about Path with Art. She had always wanted to take real painting classes, and signed up for an 8-week watercolor course. Tracy has signed up for class every quarter since and found herself trying things she never would have tried – printmaking, portrait painting, sculpture. During Tracy’s printmaking course, her grown daughter, Holly, went missing while traveling through Oregon. Six weeks later, her body was recovered from the Columbia River Gorge. Through all of this, Path with Art gave Tracy a peaceful place to be, and she only missed class to make arrangements for her daughter’s funeral. Making art gave her something to focus on so she could remain emotionally stable. She honored her daughter through painting her portrait.